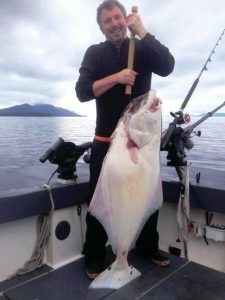 Halibut fishing in the waters off Ketchikan, Alaska, also creates instant memories. In fact, you could spend days on the water without ever baiting a hook and it is likely that the sheer beauty of Ketchikan’s land- and seascape would create a mental photo album to last you a lifetime. If you love to fish, though, adding halibut to your bucket list will add an amazing dimension to your fishing experience. Anglers Adventures, owned and operated by Captain Brian Ringeisen, has developed a dynamic formula for adventures that excite individual fishing enthusiasts to families hoping to create unforgettable experiences. The formula starts with safety. Captain Brian is CPR and First-Aid certified, and he is also a licensed captain and a veteran of the United States Coast Guard. The formula then adds the safety and security of Captain Brian’s vessel, The Sierra Dawn, a meticulously maintained vessel built for fishing in the waters off Ketchikan. The Sierra Dawn is not simply a reliable seaworthy vessel; however, it is also a comfortable home for the duration of your adventure. After a long day of straining muscles in your attempts to catch some halibut, you get to relax in the comforts of the boat. You and your fellow adventurers can enjoy privacy in the comfort of your climate-controlled cabin and private bathroom. Fishing for halibut with Anglers Adventures is not only a fishing adventure. 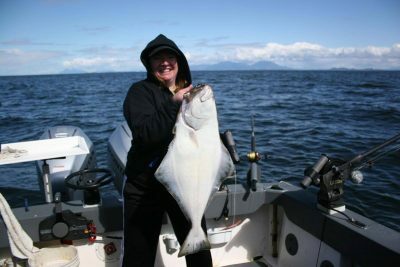 By chartering a halibut fishing trip, you experience a centuries-old native tradition. Halibut have been an important food source for native Alaskans for centuries, if not longer. It is virtually impossible to set out on the waters of Ketchikan in search of halibut without feeling a sense of awe in the power of nature. To schedule a halibut fishing trip or ask some questions, contact Anglers Adventures by calling (907) 254-0880 or emailing brian@anglers-adventures.com.